Hello followerses! Smeagol has come back! We had a very good idea for posts to do this month, but the short blogger could not help us. She says she had no creativity. So we will answer questions instead! Very long ago, Rogan sends us a question. He asks, "Dear Gollum, What happened to all your hair? No Offence . Rogan." What happened to our hair? We have fabulous hair! And we takes very good care of it. It can read about it at the end of this post! Now let us answer more questions! We takes these from tumblr. It is a long list, so we will do part of it. We are happy that the movie Andy Serkis worked so hard on is out! But we are not happy to see so many pictures of Bagginses. 2-Post a picture of yourself. 3-Do you ever wish you were someone else? Sometimes we wish that we were our Precious. We doesn't remember. The short blogger says about 589. 8-What did you do on your last birthday? Smeagol did not celebrate his birthday for a long time. But we remembers one birthday. We were fishing with Deagol. And he gave us the Precious. 9-What is one thing you would like to accomplish before your next birthday? 11-Have you ever dyed your hair? Blue. People likes Master's big blue eyeses, maybe they likes ours too? 13-If you could change your eye color, would you? 18-Do you have any tattoos? If we did, it would say "Precious" in runes. 19-Do you have any piercings? We use both our handses. No! Smoke rising in the sky! Tells nasty men where we are! 24-Do you have any pets? 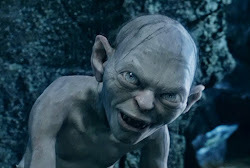 Smeagol tries to get his Precious back but people keep making him answer questions about the Precious or making poor Smeagol lead them to Mordor. So we are a "tour guide." 27-Do you have any “rules” about food? No nasty elf bread. Avoid orcses if we can. 29-What would you say is your best quality? Our riddles! We are good at riddles! 30-What do you think you’re really good at? 31-What do you think you’re really bad at? Our throat cannot swallow nasty elf bread though we are hungry. 33-Are you a bad person? 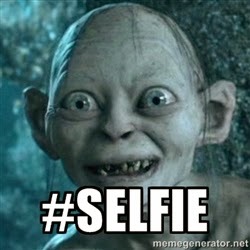 Smeagol is good. Good Smeagol. The Fat Hobbit says we are bad. 34-Are you nice to everyone? We will be nice to them if they are nice to us. 36-Has someone ever spread a nasty rumor about you? Peter Jackson says we has nine teeth. 37-What is your ideal bed? Why? 38-Did you wake up cranky? 39-Do you sleep with a stuffed toy? 42-What you want to be when you “get older”? 43-What are your career goals? 44-What is your ideal career? Telling hobbitses "no!" when they ask for directions. 45-Is your life anything like it was two years ago? No, we have our own blog now. Yes, we thinks about how Baggins stole our Precious a lot. It makes us angry. 47-Have you ever had an imaginary friend? Smeagol doesn't have a room, so we talks about the Misty Mountains. 49-Do you have any phobias? We are afraid we'll never find our Precious again. 50-Have you ever been to a psychiatrist/therapist? 51-Are you allergic to anything? If so, what? Hobbitses and nasty elf bread. Stickses and stoneses may break our boneses but Peter Jackson's changes to our books never hurts us. 53-Ever come close to death? 60-Do you have a facebook? If so, would you add the person who sent you this? There are pages of us, but we doesn't run any of them. 61-Do you have any pictures on your Facebook? Sneak, as the Fat Hobbit would say. We likes to talk to our Precious, but we doesn't think it's weird. We wants to be the Fat Hobbit so we can fall in the mud. Who is it? We are not leaving a compliment! Great answers, Smeagol. I hope you can find your precious again. Hey Gollum, long time no see. Have you been with Arda yet to see DOS? Vellvin - Very long time. Yes, we have seen it. We liked the parts without Baggins. NO WORDS TOO AWESOME HI SMEAGOL TELL ARDA SHE'S AMAZING PLEASE THANKS GORGEOUS! Staples thinks we're gorgeous, precious! It likes us! We goes to tell the Short Blogger what it says, but we thinks our blog is much better than her's.